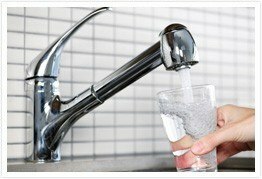 Do You Need to Schedule Water Testing at Your Home? Home > Blog > Do You Need to Schedule Water Testing at Your Home? Have you ever thought that your home drinking water could be contaminated and you just don’t know about it? The water entering your home could be filled with bacteria and dangerous chemicals. But what is the way to know if that’s true? Water testing is a great solution to this problem. There are two major ways how water enters your home’s plumbing system. You either use a private well or have access to the local water department’s supply. Nowadays the municipality’s water supply is available to the majority of people. In this case both ground water and surface water are collected by the city and then handled at a water treatment facility. The treatment helps to get rid of harmful bacteria, chemicals and contaminants. After the water treatment, it’s then stored in massive water reservoirs. The next step is water entering the city’s underground pipes and its transportation to each home’s main supply line. From there water enters your home and travels through different pipes until it pours out into the tub, shower, dishwasher, washing machine, and so on. However, it can happen that your water treatment facility doesn’t remove all contaminants. Other times, the contaminants get in through various pipes the water comes into contact with on its way to your home. Contaminated water becomes a problem and it isn’t something you want to deal with as a homeowner. Under the Clean Water Act (CWA) which is the primary federal law in the United States governing water pollution, the Environmental Protection Agency (EPA) is obliged to establish rules for safe levels of contaminants and towns and cities are required to test their drinking water supply and publish the results on a regular basis. So there will always be trace elements of some contaminants in your water. The key is to ensure that your water falls within the EPA’s safe standards – especially when it comes to things like lead, radium, silver, barium, and other hazardous waterborne contaminants. There are some certain signs that you should be aware of when it comes to every day drinking water, cooking, cleaning and bathing. If you notice any strange features or smells in your water, schedule home water evaluation ASAP that will guarantee your water safety. A common occurrence in tap water is its cloudiness, but it is not necessarily a sign of contamination. Fill a glass with water and let it sit for a couple of minutes, if the water clears from top to bottom then it’s just air bubbles. If it doesn’t and stays cloudy, it’s time to test your water. Drinking water shouldn’t smell. If your drinking water starts smelling more like chlorine (or swimming pool), then something is possibly wrong. Municipal water treatment facilities do add permissible amounts of chlorine to kill bacteria, but they shouldn’t cause a smell. Excessive amount of chlorine can be dangerous to your health, so check your water. The most frequent discoloration is brown or orange colors. If you see a tint of those colors in your drinking water, stop drinking it. Often it is a sign of extra iron or manganese in the water. The reason could also be excavation near the water supplies as well as old water pipes that are rusting. Regardless of the cause, test your water immediately. If your water smells like rotten eggs, you definitely smell sulfur, which usually occurs in the ground. There should be some trace amounts of sulfur in drinking water, but they shouldn’t have strong odor. High levels of sulfur cause intestinal distress and dehydration. Even if you haven’t had any plumbing issues in your own home, watch for your neighbors (whose houses were built around at the same time as yours) who might experience plumbing issues. For example, if their pipes are deteriorating and causing problems with their drinking water, it’s possible that your pipes are deteriorating as well. Don’t ignore any physical symptoms such as stomach ache, diarrhea, nausea, cramps and headache. While physical symptoms usually indicate that you’ve been exposed to contaminated drinking water for quite some time, it’s better to deal with it sooner than later. Make sure to consult your family doctor. At Orange County Plumbing Heating & Air Conditioning we recommend doing water testing every five-six years, even if there are no apparent signs that anything’s wrong. Conditions in the municipal plumbing may have changed since the last time you had water testing performed, so it is better to take necessary precautions. If you receive your drinking water from a private well, you need to have testing done every year, since there is a high possibility of contaminants entering the water supply through groundwater. After moving into a new house, have water testing done to ensure that you’re drinking and using the best quality water possible. If you want to arrange water testing procedure in Orange County for your commercial or residential facility, contact our plumbers. Our plumbers can also install a wide variety of water treatment systems.